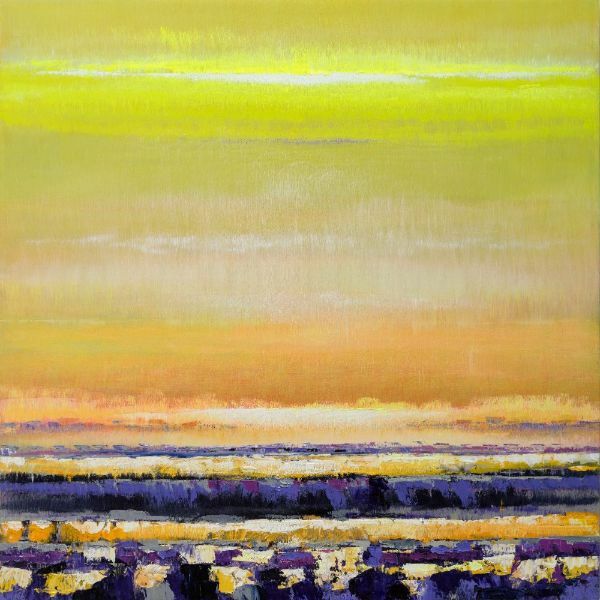 Inspired by the classical composition of the countryside, Bruno Kurz (*1957) produces nuanced, abstract color landscapes of unbelievable illumination and depth. Through layering as well as the combination of unconventional materials – gauze, sheet metal, resin – the artist accomplishes wild optical impressions. Words such as transparency, levity, and dissolution describe the effect best. Bruno Kurz manages to transform the classic canvas painting into a field of color floating in front of the wall. The thoroughly reflective resin layers and metallic surfaces create light tricks and reflections that define the atmosphere of the works.